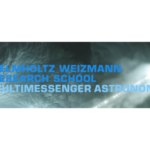 The Helmholtz Association is funding an international graduate school for multi-messenger astronomy, which is organised by DESY, the Humboldt University Berlin, the University of Potsdam and the Israeli Weizmann Institute of Science. Multimessenger astronomy, the exploration of the Universe using a multitude of cosmic messengers, has led to several groundbreaking discoveries during the last few years, many of which built on significant contributions from the partner institutions. With a new generation of instruments, advanced methods of exploiting their data, as well as extensive theoretical modeling, members of this research school have unique research opportunities in this emerging field. The partner institutions are involved in several leading observatories, e.g. the Cherenkov Telescope Array, the IceCube neutrino observatory or the Zwicky Transient Facility, to which the students will have access.